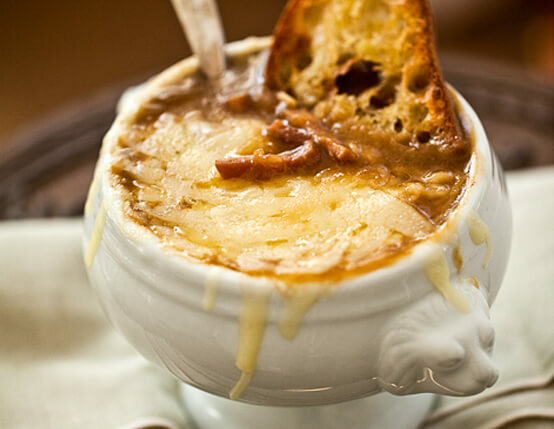 This classic French onion soup recipe gets a boost from Jones ham. Perfect for lunch, dinner or first course. 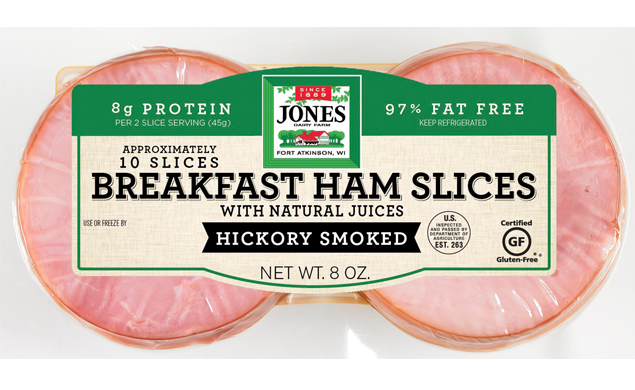 This recipe is made with Jones Ham Slices. Heat butter in a large (12-inch) deep sauté pan or Dutch oven over medium heat until melted. Add onions and 1/2 teaspoon salt, stirring to coat with butter. Lower heat to medium-low, cover pan and cook 15 minutes, or until onions are softened. Uncover pan; continue to cook slowly until onions are deep golden brown and very soft, stirring frequently and scraping the bottom of the pan, about 30 minutes. Sprinkle the flour over onions, stir and cook a few minutes until flour is absorbed. Pour in stock, bring to a simmer and cook 10 minutes to thicken the soup slightly. Stir in ham; season to taste with salt and pepper. Heat broiler; rub each slice of bread with a garlic clove and brush on both sides with olive oil. Toast the bread for a few minutes on each side until golden. Portion soup into 4 heatproof bowls; top each bowl with 1/2 cup cheese and place on a sheet pan under the broiler until the cheese is melted and bubbling. Place a crouton on top of each bowl of soup and serve immediately.